There are hundreds of complicated parts in your vehicle’s engine, each part working in conjunction so that your vehicle will start up and run right. However, as time passes, each part can become worn out, leading to a loss in fuel economy and performance. The Garage Auto Repair’s technicians have been trained to properly work and fix on today’s engines, ensuring your vehicle’s lifespan is extended. While engine tune-ups have seen some big changes in the last few years, the basics of how gasoline engines hasn’t. Vehicle cylinders need clean air and gas so that combustion, originated by the spark plug, produces the necessary power to get the vehicle moving. Dirty air, clogged fuel injectors and corroded spark plugs can lead to a decrease in engine performance and cause poorer gas mileage and performance. This is why when check out the air filter in your vehicle, and why we make the suggestions of following the recommendations your vehicle manufacturer has laid out in terms of replacing important parts like Positive Crankcase Ventilation valves, spark plugs and fuel filters when they’re not working like they should. If you do a spark plug replacement or get a tune-up at the recommended maintenance interval, your engine will be easier to start up, have lower emissions, better fuel economy and bring back the lost power. Another service, unknowingly disregarded, that’s aimed to keep the engine running right is the cleaning of the fuel intake system and fuel injectors. When the fuel injectors have deposits and dirt collected on them, the fuel that gets to the engine is limited, which can decrease the engine’s responsiveness and performance. Our experienced technicians can do a Fuel Injection Service that eliminates those deposits and boosts the vehicle’s gas mileage and performance. The key to ensure maximum fuel efficiency engine performance and vehicle reliability is getting your fuel ignition system maintained on a regular basis. Whether you need a repair to a fuel system issue or to keep an issue from occurring in the first place, our The Garage Auto Repair technicians are here to help your vehicle stay ready and raring to go. One of the biggest reasons for vehicle mechanical failure is a failure in the cooling system. If this system isn’t working properly, your transmission and engine undergo some extremely serious stress-related damage. 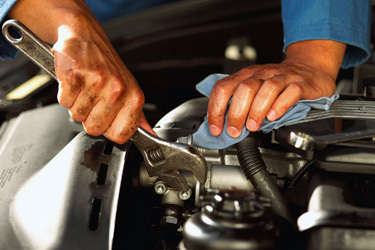 Most drain and refill services just replace half of the polluted coolant. However, with our Radiator Flush Service, we’ll eliminate 95 percent of the polluted coolant and add fresh coolant along with an exclusive product designed to stop corrosion, foaming and minor leaks.